The Rock Creek Cabin PIT project was successfully completed in May 1997. During two six-day sessions, 19 PIT volunteers working under the direction of forest and Missoula District staff removed the existing cedar-shake roof and replaced it with historically accurate sawn-cedar shingles, rebuilt the existing front porch, and constructed a historically sympathetic back-porch addition. The work completed at Rock Creek Cabin arrested the deterioration of the roof and front porch, brought the roof back to its original historic appearance. The cabin, with the back-porch addition, is now an efficient and comfortable facility for forest and district personnel and the general public, if Rock Creek Cabin is added to the cabin-rental program. Twenty PIT volunteers, all experienced Travelers, participated in this endeavor and contributed 850 long hours. As most volunteers had experience in basic carpentry and wood-shingle roofing, little time was spent training, making their efforts very effective. The PIT volunteers were a diverse group that included retired FS engineers, planners, and foresters; retired CIA, military, and law enforcement personnel; and university students, schoolteachers, and a social worker. Two FS employees—Lexie Carroll (Facilities Engineer, Bighorn National Forest) and Ben Munger (Archaeologist, Beaverhead National Forest) attended to learn the principles of historic preservation and how to run an effective PIT project focused on historic preservation. The average work day was 9–10 hours. Opportunities were made to ensure that each volunteer had the chance to experience different facets of the project such as log hewing with a broad axe, wood-shingle roofing, and porch reconstruction. In the evening, programs were held focusing on heritage resources and historic preservation. Evening programs included a slide presentation on the history of the renovation of Hogback Homestead and videos on the Nez Perce National Historic Trail and historic preservation skills such as log working and wood-shingle roofing. The volunteers did not come to be entertained; rather they came to work, learn new skills, meet new people (or see old friends), and contribute to the Forest Service mission of restoration of historic properties. I believe their expectations were met. Hogback Homestead served as the base camp for the project. The volunteers provided their own tents and sleeping bags and camped in the meadow behind the cabin. Fred Bischoff served as cook and provided breakfast and dinner at the cabin. Lunches were transported 1.5 miles to Rock Creek Cabin and served on the job site. Four solar showers were available for the volunteers, and they proved to be very popular by the second or third day of each work week. Volunteers and staff were transported back and forth to the job site by Forest Service van each day to ameliorate vehicle congestion on the Rock Creek Road and the parking situation at the cabin. Hogback Homestead was an excellent base camp, with potable water, toilet facilities, and the cabin, which served as a cooking and dining facility. The two upstair bedrooms were used the second week by out-of-state PIT volunteers who traveled to Missoula by commercial airline and could not easily bring the necessary camping equipment. This project was extremely successful. In fact Ken Duce, Facilities Manager, Lolo National Forest, believes this was “the best PIT restoration project we have ever done.” The scheduled tasks were completed to the Secretary of the Interior’s standards. This was accomplished in spite of high water from spring runoff that surrounded the job site the second week, sometimes to a depth of 8 inches! The volunteers had a great experience. They worked safely and learned historic preservation philosophy and some new hands-on skills, met many new friends, and learned much about our agency’s mission. A conservative estimate is that the PIT volunteers provided approximately $12,500 of skilled and semiskilled labor. The total costs of hiring the cook and purchasing groceries and supplies were $3,000. We received a pretty fair return on our investment, and this doesn’t take into account the support and goodwill generated toward heritage resources, the Lolo National Forest, and the agency as a whole. Special recognition should be given to the Missoula District support staff who made this project possible—Gene Thompson, Jerry Grebenc, and Libby Langston. 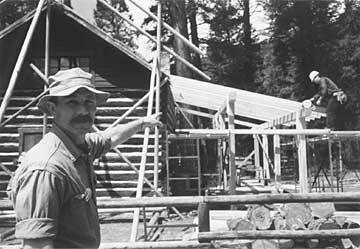 Gene assisted with the project planning, training, and supervision of the volunteers, especially with the log hewing. Jerry worked long, hard hours to ensure that the tools and equipment were ready and in safe working condition. Libby contacted KECI television and arranged for a newscast that covered the Rock Creek Cabin restoration project and PIT. 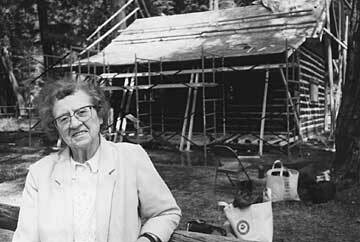 She also brought Mrs. Stanley Lukens to the job site the second week. Mrs. Luken’s husband had worked for the Forest Service from 1921 until 1949. Over a 10-year period, she stayed at Rock Creek Cabin for 2–3 months a year with her husband when he was ranger at Bonita from 1939 to 1949. The volunteers and staff alike found her stories and descriptions of the early Forest Service and Rock Creek Cabin fascinating and informative.